A tour of the school can be arranged by appointment, please Contact Us. We would like to invite our prospective students and their families to our Open Evening on the 25th September, 6.30pm – 8.30pm. There will be a short presentation by the Headteacher at 6.30pm, repeated at 7.15pm. If you can’t make our Open Evening or Mornings, you can contact the school on 01264 364533 for more information and arrange a tour. 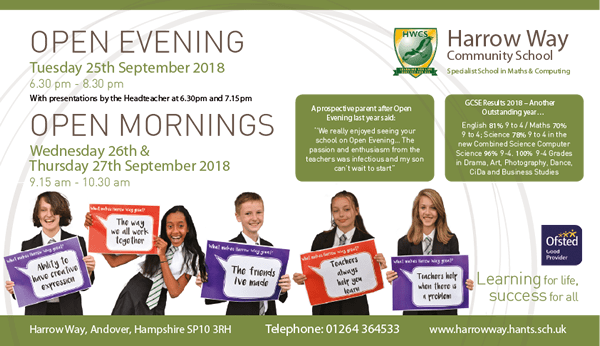 If you would like to see the school during a working day, then please come to our Open Mornings on the 26th and 27th September 9.15am – 10.30am. Harrow Way Activity Survey – The data and information in this booklet has been compiled from the Client Caseload Information System (CCIS) database used by the Youth Support Service (YSS) in Hampshire, Isle of Wight, Portsmouth and Southampton. The content is generated by a Program designed to identify the ‘destinations’, as at 1st November 2012, of pupils who completed Year 11 in the academic year 2011/12.